During his service in the National Guard, Ron met Kathryn Aspaas through a mutual friend in 1966, and married in Feb. 1967. Ron lived and farmed in Iowa with his family until 1969. Ron and Kathryn then bought out Kathryn’s parents’ (Nils and Faye Aspaas) homestead near Baltic, and moved to South Dakota to farm and raise livestock (but NOT dairy cattle — as he had vowed “never to milk another cow,” if he went out on his own). Ron often told the story of how he went to the local elevator that spring for 3 herbicides he commonly used in Iowa. One was way over-priced, and the other two they had never heard of; so, he went back to Iowa to get those products and picked some up for his neighbors in South Dakota, as well. That was the start of Hefty Farm Supply, which later became Hefty Seed Company. Ron worked tirelessly on his farm and in building his business, doing as much as possible by himself. He was also very instrumental within the agriculture and business communities, serving as the president of the South Dakota Soybean Association, serving on the board of directors at Dakota State Bank, and promoting the ethanol industry. 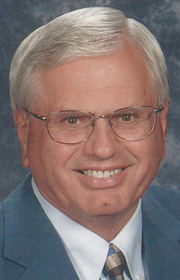 He was also president of the East Nidaros Lutheran Church congregation for many years, as well as being an active and faithful member at Gloria Dei Lutheran Church and Gold Canyon United Methodist Church. In 1985, his wife Kathryn died from a long battle with leukemia. A couple of years later, Kathryn’s aunt introduced Ron to Eloise Spilde Stensaas. They were married in 1988. For the past 15 years, they spent much of their winters in Arizona, where they enjoyed golfing and connecting with many friends. Ron had been fully retired for over 10 years, but for those that knew him well, he will be remembered as a hard worker, a talker, and a guy who got pretty upset when people weren’t giving all-out effort. Celebrating their time with Ron are his wife of 31 years, Eloise; Ron’s children, Brian (Jenny), Darren (Shelley), and Jannel (Paul Brueggeman); his stepson, Brad (Traci) Stensaas; Ron’s sister Joyce (Marlin Fjelland), his brother Monte (Bonnie); his brothers-in-law, Lynn Aspaas, Gary Spilde, Dan (Kathy) Spilde; and sister-in-law Bonnie (Joe Hilt); 15 grandchildren, Zach, Jetta, Delaney, Mason, Carson, Lincoln, Eliana, Natalie, John, Ian, Graham, Nick (Maggie), Ryan, Andrew, Tanner; and 1 great-grandchild, Cooper; and numerous nieces and nephews. Ron was preceded in death by his wife, Kathryn; parents, Pete and Ruth Hefty; grandchildren, Grace Hefty, Jonas Brueggeman; and sisters-in-law Barbara Aspaas and Shirley Spilde. Funeral services will begin at 11:00 AM Monday, April 15, 2019, at Gloria Dei Lutheran Church in Sioux Falls. Interment will be in the East Nidaros Lutheran Cemetery, rural Baltic. Visitation will be from 5-7:00 PM Sunday, at the church, with a Prayer Service beginning at 6:30 PM. The family requests that, in lieu of flowers, memorials be directed to either Gloria Dei Lutheran Church, Sioux Falls, SD or Gold Canyon United Methodist Church, Gold Canyon, AZ.